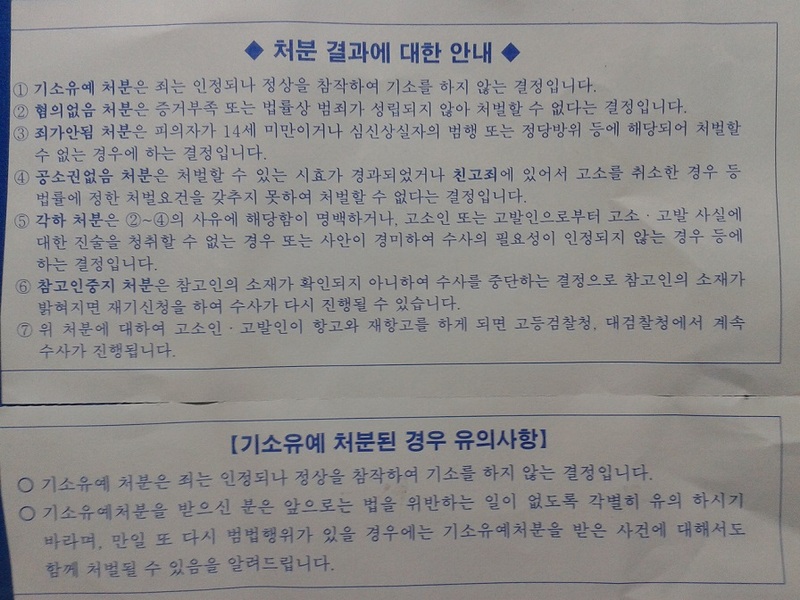 3) Simply reporting the crime (신고): If you are a 3rd party / This is not a formal request for criminal punishment. According to Article 237 of the Korean Criminal Procedure Act (형사소송법), a criminal complaint/accusation can be made either to a prosecutor or a police officer (orally or in writing). For certain crimes, a criminal complaint or accusation is prerequisite for indictment (prosecution). For example, a criminal complaint is required (to indict) for the crime of “Insult” (모욕). Similarly, a criminal accusation is required (to indict) for certain tax crimes. A criminal complaint/accusation may be revoked at anytime before the sentencing by the “trial of first instance” (e.g., trial court). This action renders the corresponding indictment invalid. 1) Suspension of Indictment (기소유예): A crime was indeed committed, but the prosecutor is willing to let this one go. The prosecutor takes into account the perpetrator’s age, character, intelligence, relationship to the victim, motive, actions taken afterwards, etc. Similar to why Sherlock Holmes let the thief go in The Adventure of the Blue Carbuncle. Holmes felt arresting Ryder would only make him into a more hardened criminal later. “Maybe I am committing a felony, but I may be saving a soul. Send him to jail now, you make him a jailbird for life…” -SH. 2) Non-Suspicion (혐의없음): When the act is not really a crime or when there is not enough evidence. In such case, the prosecutor will then look into whether the complainant/accuser has intentionally made a false accusation. If so, the complainant/accuser can be punished for the crime of “False Accusation” (무고) under the Criminal Act (형법). 3) Not a Crime (죄가안됨): When the perpetrator cannot be punished because he/she clearly has a valid criminal defense such as insanity, intoxication, self-defense, etc. The age of criminal responsibility in Korea is 14. 4) No Arraignment Right (공소권없음): When the perpetrator cannot be indicted because the (criminal) statute of limitations has elapsed, the corresponding criminal complaint/accusation has been revoked, etc. 5) Dismissal (각하): When the complaint/accusation itself is lacking or invalid. When the “wrong” person has filed the complaint/accusation, etc. In case of “disposition of non-indictment,” the complainant/accuser may appeal such a decision. This is called “항고.” If the appeal, too, is denied, the complainant/accuser may reappeal the decision. This is called “재정신청.” The decision is made by the court. The court’s decision is final. [DID YOU KNOW] A disposition of non-indictment will appear on one’s investigation record for 5 years (but not on one’s criminal record at all).